Training Registration Certificates are folded and placed between the front cover and the first page of your manual. DO NOT lose this certificate. You must bring this page with you when you take your certification exam. The exam proctor from the Wisconsin Department of Agriculture, Trade and Consumer Protection (DATCP) will collect it. Your exam will not be processed without the certificate. Manuals will no longer have this certificate as a tear out page as it was in the past. If you lose this form there is a $10 fee to replace it, so please. This is important if you are enrolled or going to enroll in one of UW PAT Program’s online courses (Turf & Landscape, Aquatic & Mosquito or Structural Pest Control). Access to the course involves a three step process with 3 separate email invites. Step 1: You will receive an invite from the Manifest Group System. It will have the group name of the course you are enrolling in. Please follow these instructions. This is a request to set up a guest Identification–essentially what is called a NetID. Step 2: Once you are sent a NetID, you then have to accept the second email invite to activate your NetID. If you do not do this, then we can’t invite you to the course. Step 3: Once you have been granted a NetID and activated it, the PAT Program can then invite you to the course that you purchased. Please follow these instructions. This is not the easiest procedure, but due to security and other reasons it is the one that the University has given us. If you received your invite and deleted it please contact Glenn Nice (below) and he will send out another invite. 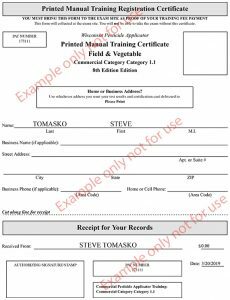 Ordering of certification fees (with training materials) required to become a certified applicator in the State of Wisconsin. Supplementary training materials and live training / review sessions (usually in the months of January – April). Got a question about certification? Give us a call, we’re here to help. The training materials come as a printed manual, an electronic PDF manual or an online course (your choice). Don’t know which to choose? Check out this podcast for a brief introduction to these choices: What Should I Order? Note: The UW PAT program does NOT provide the Commercial Certification Exam. Also, the exam is NOT given at the UW-Madison campus. Exams are given ONLY at DATCP test-only facilities (see below) or at training/review sessions. Email: datcpcertexam@wi.gov if you need to schedule an exam or cancel one that you have scheduled (if not using the online exam scheduling site in the link above.